The bright sun warmed the late October afternoon. 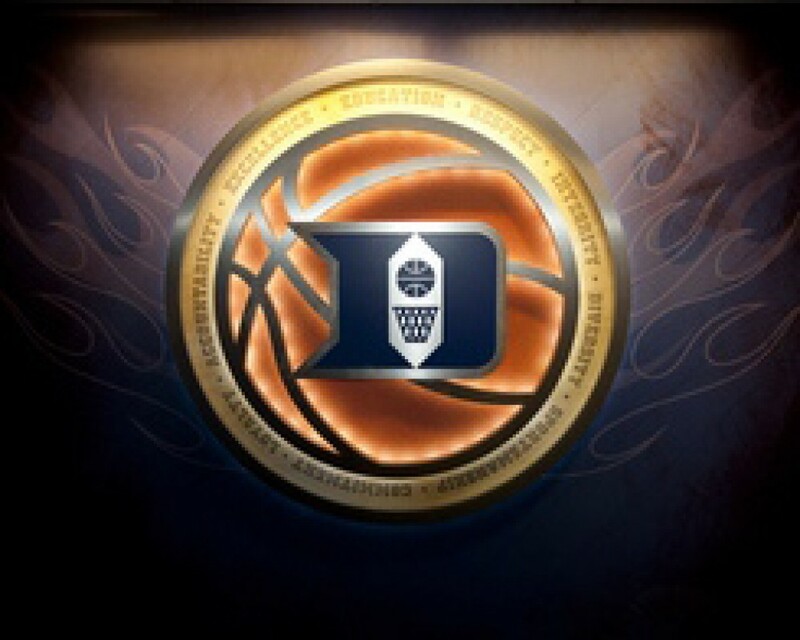 As the doors opened to Cameron Indoor Stadium you could sense the temperature was going to rise inside. 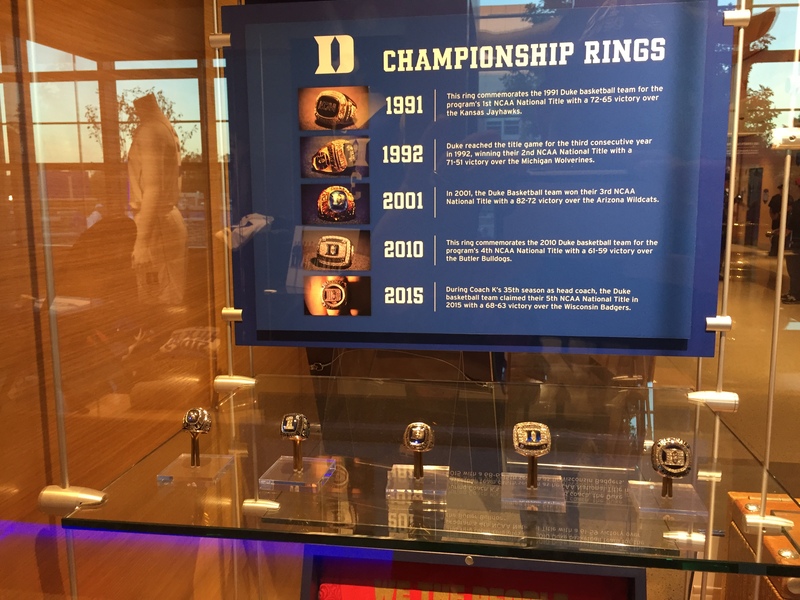 My wife and I moved through the tight security and stopped in the foyer to look at some of the displays – 5 NCAA Championship rings, various sizes and colours of Nike basketball shoes worn by Duke standouts, and a history timeline of the Cameron construction. We walked up to the second level and found our section only to have the Usher point out that we needed to weave from an upper row down to the row below and back up to reach our seats at the top of Cameron next to a steel girder. Cameron Crazies wearing light blue horns had already filled their seats directly across the Court at the Sideline. Graduate students filled the end line seats at both ends of the court. The rest of the crowd filled in their seats over the next hour and a half. For each of the 5 years we have attended Countdown, the pre-game entertainment has varied a little from the previous year. This year there was gift certificate offered if 3 shots could be made within 30 seconds. An award winning male dancer from Ireland tapped at mid-court over protective paper. Musical chairs were played for 5 contestants paired with a Duke Woman’s Basketball teammate. There were acapella singers, and an East Indian cultural dance to entertain before the Main Event. 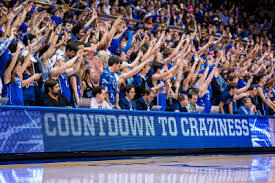 As 8 PM, approached the song “Every Time We Touch” rang across the stadium and the Cameron Crazies began to clap in unison along with the fans standing and joining in. When the chorus played, my wife and I kept up with the Crazies pumping our arms up and down. The National Guard marched out onto the floor and chills went down my spine as the Duke women sang the Anthem. Thank you, Duke fans, for displaying Blue Devil and American Pride !!! 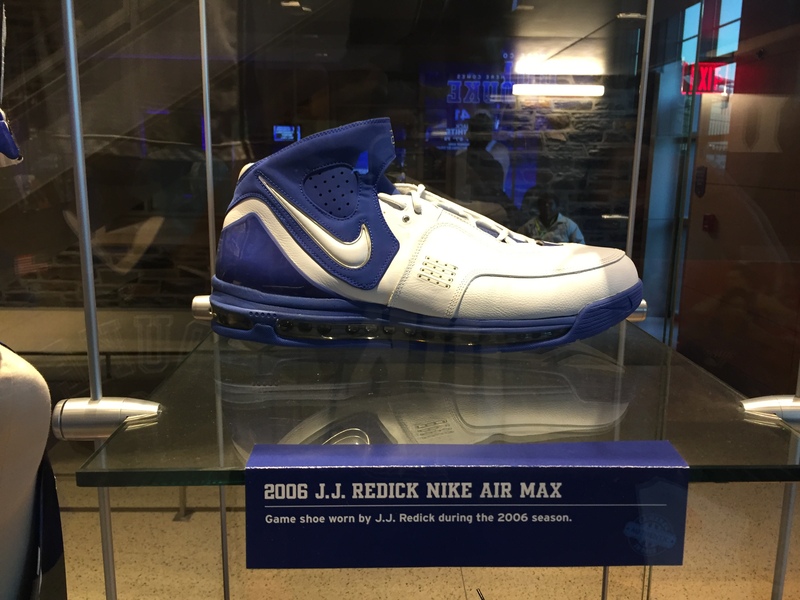 The crowd remained standing and began to reverberate yells of approval and clapped as a 2 minute video of the Duke basketball team played on the scoreboard. Upon its completion, a florescent green string extended down from the scoreboard to the Court. My wife asked me what it meant. Unknowingly, I answered it must represent an electric chord. Jagged lights flashed on the court and radiated out from Center Court to the End Lines. The players were introduced with their picture shown on half of the Court and their signature in florescent green on the other half, while the player danced at mid-court to their favorite song. Having watched some of the Freshmen highlight videos, it was interesting to see their skills in real time combined with some impressive improvements from the returning players. Javin DeLaurier was the top rebounder with 9, 3 Assists, and only scoring 3 Points. Later I learned he was nursing a tender hamstring. 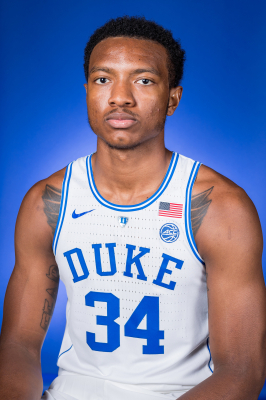 The Blue Team was led by Gary Trent, who scored 13 points, while Wendell Carter had 11, and Alex O’Connell, dwarfed by the physical stature of the “Bigs,” scored an impressive 8 Points driving to the basket and from outside. Trevon Duval played Point Guard for the Blue Team with 3 Assists and 4 Turnovers. His counterpart on the White Team, Jordan Goldwire showed some “Heads Up” skills with no turnovers and good defense. Jack White led his team with 6 boards. Marques Bolden took several minutes to work his way among the “Bigs” and finished strong. Marvin Bagley III scored 12 Points. while Grayson Allen had 3 Assists and 13 Points. He should be a “beast” in all phases of the game this season. 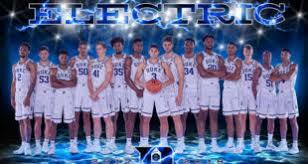 With so many “Bigs” to help out this season, this team could be impressive, of course, as long as they show up with a solid defense. Wendell is a 6’10” 259 lb. Forward who will wear #34 this season. He was ranked the #1 Power Forward, and Overall #4 player in ESPN’s Class of 2017. Scout ranked him #4 and Rivals had him at #5. Wendell attended Pace Academy in Atlanta where he carried a 3.6 GPA that included Honours Calculus. He also participated in the annual school play this year and last. Wendell was born in Atlanta to Wendell Sr. and Kylia Carter,who both played college basketball. He at Delta State and she at the University of Mississippi. Dad followed up college with a professional career in the Dominican Republic. I’ve done a ton of reading about this young gentleman and am well impressed with him. He is the epitome of the Student-Athlete. He and his family travel everywhere, including to visit with Duke Alum, Coach Tommy Amaker at Harvard, where Wendell’s Mom wanted him to go, hence you might be able to identify his parents as they sport maroon and white “HARVARD” jackets. Somehow I think he did pretty well by choosing Duke !! !